When it comes down to planning your spring workout routine, remember just like a fashion trend, there is no cookie-cutter approach to fitness. It is important to decide what is most important to you, your goals and your individual circumstances when selecting a boot camp to join. What Do Skinny Jeans and Boot Camps Have in Common? Title got your attention? The answer is, they are both trendy and abundant but not necessarily the right fit for everyone. Boot camps are a common sighting these days, particularly as the weather becomes a little warmer with the spring season. Large groups of first time fitness goers and enthusiasts alike fill the parks with the urgency to shed their "winter" weight and get ready for the warmer, less-clothed days ahead. Boot camps are not a new form of exercise and definitely take place all-year-round, but there is also something about the onset of longer days and warmer weather that draws many fitness instructors and fitness seekers by the masses. 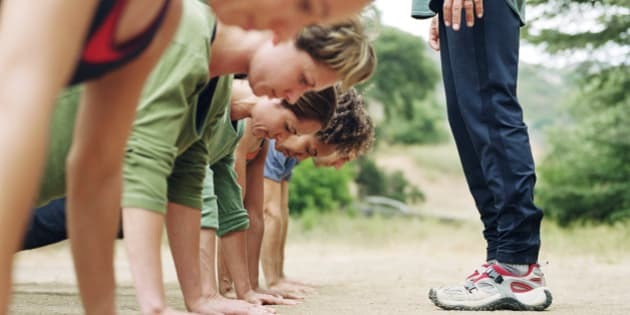 The rise of the outdoor boot camp will once again become prevalent in your city, but before you pre-register and jump in feet first -- do your research. These group fitness classes have many advantages, they are cost-effective, create a sense of community and accountability, and in most cases can be quite intense -- many of them pushing you to deliver more effort that you ever would if you were left to your own devices. As much as there are positives of training in a large group boot camp format, there are also cautions to be aware of. Here are some tips to selecting the right fit for you. Many boot camps grow through word of mouth; you'd be surprised what type of information you can get by asking co-workers, friends and neighbours. Be sure that you are choosing a reputable trainer/company that has the proper qualifications to instruct and coach an effective class but also the academic background and experience to ensure participants are staying away from injury. Here are some tips on how to choose a trainer. The size of a boot camp varies widely from four up to as many as 40 and beyond. The important thing to note here is the trainer to participant ratio. Typically what happens is the larger the group the less personalized the class becomes. It's important to note that everybody has different levels of fitness, different body mechanics, and also some people may have previous injuries and ailments that surface during exercise. The caution with larger groups is that it becomes impossible to be "hand's on" with all participants. Although price per class generally becomes more cost-effective with larger groups, the workouts themselves become more generalized and the risk of injury higher. It is important to decide what is most important to you, your goals and your individual circumstances when selecting a boot camp to join. As a general rule of thumb, a trainer to participant ratio of approximately 1:10 (one trainer per 10 participants) is a small enough group that individual specifics can be addressed with an experienced trainer. Any reputable boot camp should allow you to interview the instructor and "test drive" a boot camp class. This provides you the opportunity to try out the class prior to making your decision -- after all, you don't just buy a car without getting behind the wheel first! Ensuring you do a test drive allows you to sample the trainer's style, personality, level of professionalism, as well as the exercise focus and intensity of the workout. Trying out the class first is truly the only way you can make an informed decision before committing to an entire boot camp series. What can often happen with a large boot camp format is the tendency to become extremely repetitive with exercises and movements that are not necessarily the best for your posture and joints over time. Choosing a boot camp that is based on variety and full body functional conditioning is key. Sometimes understanding the difference between regular muscular pain and unusual joint pain can also be the critical factor that saves you from overuse injuries. Try varying your weekly routine by also including other forms of exercise that are not as aggressive, such as yoga or spinning. You will find this can help prevent over stressing your tendons and joints over time. For the indecisive class-goer or for those who love to change the stimulus, there are passes that allow you to attend a wide variety of classes at some of the best studios in a city, all under one membership fee. Companies such as Fit Set and Class Pass offer access to classes anywhere for $99-per-month. So when it comes down to planning your spring workout routine, remember just like a fashion trend, there is no cookie-cutter approach to fitness. Be sure to do a little research to determine what you really want to get out of your training experience. Scheduling a test drive or signing up for a city wide class pass can help you make the choice that fits you best.